Take Route 30 North from the town of Wells. Approximately 3 miles up Route 30 there is a right hand turn that leads to a parking area. 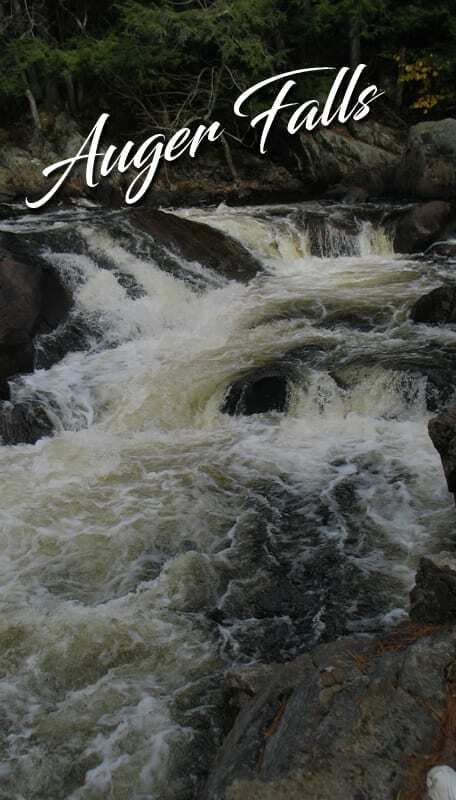 This 40 foot falls is at the beginning of a series of drops, plunges and cascades totaling over 100 feet though this narrow gorge lined with Hemlocks on the Sacandaga River. Many potholes can be seen along the edge of the gorge when the water level is low. Please be careful around the falls area, as the banks are steep and slippery. This is the trail that I hiked October 2009. After crossing the bridge the trail was marked just to the left. We followed the snowmobile trail for almost 2 miles when we heard the Falls. After hearing the Falls look to your left for some smaller trails that will lead you to them. Portions of this trail were a bit of a bushwhack. The Falls themselves are quite a site, and was informed that they were quite low this time of year. They must be even more impressive when overflowing with runoff in the spring. If you are bringing small children approach the Falls from the Route 30 side instead as a fall from this side would be perilous.